White High Gloss Modern Sideboard Cupboard Unit Contemporary "Valencia"
Black High Gloss Modern Sideboard Cupboard Unit Contemporary "Valencia"
A lovely functional piece with a really very charming look and feel. Depth:- 47.5cm. Stunning bedside or chairside chest handcrafted in classic Chippendale style. Overall good used/antique condition. Wear consistent with age/use. We have deep cleaned it hand condition waxed and hand polished it from top to bottom. A very well made and good-looking piece, the finish is period so lightly distressed around the edges and with normal wear. We have deep cleaned hand condition waxed and hand polished it from top to bottom. Width:- 152cm. Mahogany entry table by Bombay. Simple assembly required. Original finish. 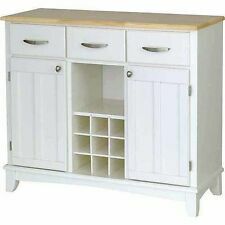 Farmhouse Buffet Sideboard Table TV Stand. From accenting your entryway to providing a place to leave those hard to find keys, buffet tables are a great addition to any decor. Farmhouse style. Product Type: Buffet Table. 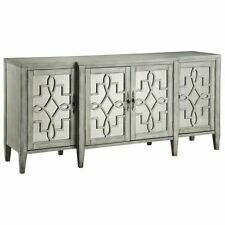 Available in two different finishes, this cabinet coordinates well with various modern furnishings. The cabinet has three open shelves for holding napkins or dishes, and the side drawers are excellent for hiding clutter. Show off your wine collection, save space and keep your wine glasses looking flawless. The espresso-finished Tiko Modern Espresso Buffet with Wine is the perfect addition for dining, living, or kitchen rooms. Here is a fine quality antique English George III oak low farmhouse dresser base, circa 1810, with wonderful narrow proportions (6ft 1⅞” wide) and in excellent condition. The style of this dresser suggests that it probably originates from the North West / West Midlands of England. We have deep cleaned hand condition waxed and hand polished it from top to bottom. Width:- 122cm. Pine sofa table. (WC035219) (JORcl). MPN: WR1241. 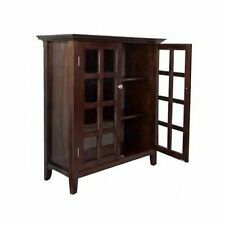 Buffet Server / Sideboard Cabinet Wine Storage, with 2 doors and 2 drawers, consists of wood and veneers, Brushed nickel hardaware. Category: Furniture, Dinettes & Bar Stools, Buffets. UPC: 802319001241. Height:- 208cm from the floor to the top of the mirror, 86cm to the marble top. A very good looking and well made piece, the walnut veneer is in fine order throughout, the plate glass is all original and panelled in the doors and main top mirror. Antique Style Egyptian Curving Wood Sideboard Inlaid Mother of Pearl. Sideboard size. Handmade Curving wood inlaid a high quality mother of pearl. All The Inlaid Work Is Done In Our Factories in Cairo, Egypt. Very solid and sturdy piece. The height is adjustable, can be used as a dining chair or a counter high Bar stool / chair. Oak Park, IL 60301. A piece that you can proudly collect, put to great use and enjoy. Baluster ring turned column supports. Here is an example of a fine quality antique Welsh Georgian oak pot board dresser base, displaying a rich oxblood colour, circa 1800, in good condition. Here is an example of a fine quality antique Welsh Georgian oak pot board dresser base, displaying a rich oxblood colour, circa 1800, originating from South Wales, which is in good condition. 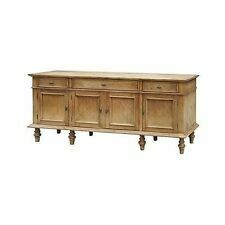 Mastercraft Furniture Co. Burled Buffet Brass Accents Casters Sideboard Mid C.
Mastercraft Buffet. Buffet (w/ casters). 72" x 19" x 31 1/2". If you are purchasing a large or delicate item, it could take a few weeks until you get your item. Otherwise, we reserve the right to re-list the item for sale. Why the Francesco Molon. Francesco credits a number of factors for his own success. This buffet is in pristine condition throughout, the heavy thick bevelled glass top is removable, it’s protected the lovely rich warm walnut surface perfectly. The cabinet has a spacious top and an open shelf that is great for storage or display. It is ideal for kitchen, dining room and restaurant. Wood Console Storage Cabinet. This modern kitchen storage cabinet is perfect to fit your kitchen or dining room and provides you with unmatched convenience. 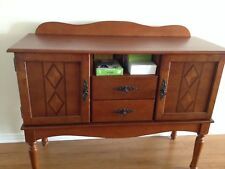 Wood Sideboard Console Cabinet. Construct of high quality non-toxic MDF and pine wood, it is sturdy and durable. High quality non-toxic MDF and pine wood construction. Two wine rack hold up 8 bottles. Use this piece for wining and dining your guests. W 58" x D 19" x H 35" 111 lbs. Very solid and sturdy piece. The height is adjustable, can be used as a dining chair or a counter high Bar stool / chair. A piece that you can proudly collect, put to great use and enjoy. Crafters and Weavers. Oak Park, IL 60301. It is a high quality piece, made with solid wood and no veneer. A piece that you can proudly collect, put to great use and enjoy. Matching pair is available. 125 N Marion st.
Sideboards and buffets have been around since at least the time of the Renaissance and have been evolving ever since. 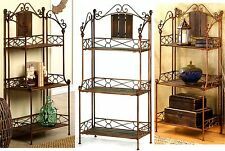 These beautiful pieces of furniture add elegance or interest to your kitchen or dining room. With the vast selection available, a style that fits your décor can be found. What is the difference between a sideboard and a buffet? There really is no difference between a sideboard and buffet. Both have drawers, shelves, and compartments to provide whats needed at the dining table or the kitchen table, whether it's serveware, glassware, table linens, or bottles of wine. Food can also be served off of a sideboard or a buffet during buffet-style lunches or dinners. A crédence is a French Gothic sideboard, while a credenza is an Italian form of this furniture. Can a sideboard or buffet have a hutch? Some sideboards or buffets either come with hutches or can be fitted with one. Hutches, provide more storage space. Sideboards and buffets with hutches seem to be found in the kitchen more than they are in a formal dining room. One alternative to a hutch is a mirror that matches the buffet. Another idea is to fit a plate rack on top of the sideboard. This both stores your dinner plates and protects them. Can a sideboard or buffet be placed in the living room? A sideboard or buffet can definitely be placed in the living room. You may want to choose one that has drawers and cabinets that hide the dinner service. A sideboard in the living room can also double as a TV cabinet. Contemporary-style sideboards with sliding doors, simple lines, and slim, tapered feet can pull a contemporary living room together. What is a tansu-style buffet? Tansu is a style of cabinetry that was originally meant to be carried around. It originated in Japan around the late 17th century. Tansu cabinets are made of both hard woods, such as chestnut, and soft woods, such as pine, and are full of decorative hardware. 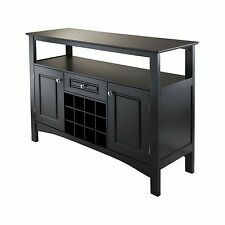 Can a sideboard be used as a bar? There is no reason not to use a sideboard as a bar. 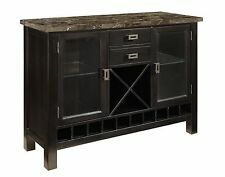 Many types of modern sideboards and buffets come with cubby holes to hold bottles of wine. There is certainly storage space for glassware, stirrers, mixing glasses, and other accoutrements that go with a bar. The top of the buffet or sideboard is a perfect place to store decanters or to group bottles of liquor and cordials on silver or mirrored trays. Marquetry is a type of furniture decoration where contrasting materials are arranged in a veneered surface to make a decoration that is flush with the surface. The material can be exotic, coloured woods or other materials, such as tortoiseshell or mother-of-pearl. This type of furniture decorating has been around since the Renaissance. A contemporary marquetry is often imitated. A sideboard or buffet with real marquetry is considered an heirloom.